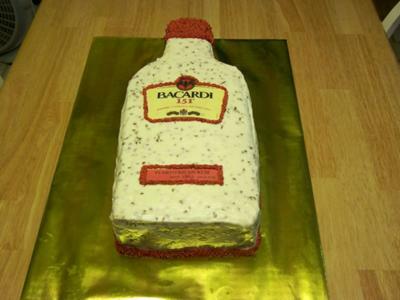 I made this Bacardi Rum cake for my husband's Christmas party. For this cake I used 2 yellow cake boxes. I substitute the water for milk,the oil for real butter, and I only use two eggs instead of three like the box says. To me this brings the cake to another dimension. I carved it into a rum bottle. I glaced it with real Bacardi rum. I iced with butter,cream cheese, and pecans icing. I ripped off the bottle labels, make a copy with my printer, laminated, and placed on the cake as on the real bottle. I made a very tiny shell border (# 13 star tip) to cover the side of the labels. Star at the bottom and to make the top of the bottle more stars with # 21 tip. That is very nice!!!!!! I love it! Are you sure you're old enough to buy rum???? ?